It is the oldest street of the town, being called for a long time ’’Elisabeta” Street. The street has 7 objectives declared historical monuments. 4 of these houses keep certain medieval elements from the 15th-17th centuries (2 with significant elements, 2 with fragments). 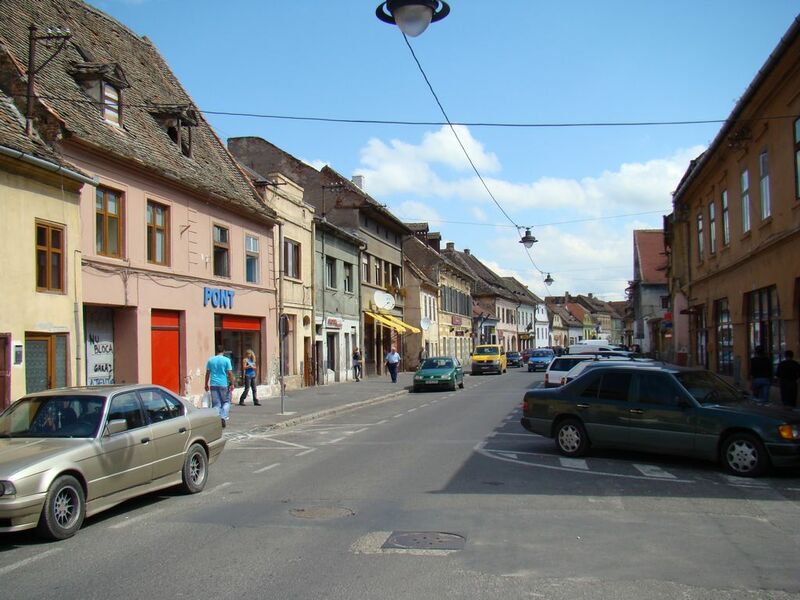 The road crossing between ’’9 Mai” Street and ’’Ocnei” Street is considered to be the centre of the Lower Town. The place is called Dragoner Square. At the end of the 19th century the flea market was organised here until 1904 when it is moved to the end of ’’Ocnei” Street. Until 1976 in the middle was a building as an island in the place of ’’Straja Dragonilor” (1687-1710). The building had certain baroque and neoclassic elements dated from 1800. At the ground floor there was a Post Office, then around the 50s-60s ’’Libraria Noastra” no. 2 which from the 70s untill its wrecking changed into ’’Libraria Lyceum”, being one of the biggest libraries in the town. The Church of St. Elisabeth Monastery owned by the Franciscan Order. During 1526-1527 the Lutheran liturgies were held here. It was knocked down in 1868. Domnul Bararu, atelierul fotografic al bunicului d-voastra era in aceasta casa?